HOUSEHOLD SIZE: Includes each person who will reside in the home. HOUSEHOLD INCOME: All income from any income source, including but not limited to, all wages, social security payments, retirement benefits, military and veteran's disability payments, unemployment benefits, welfare benefits, and interest and dividend payments. 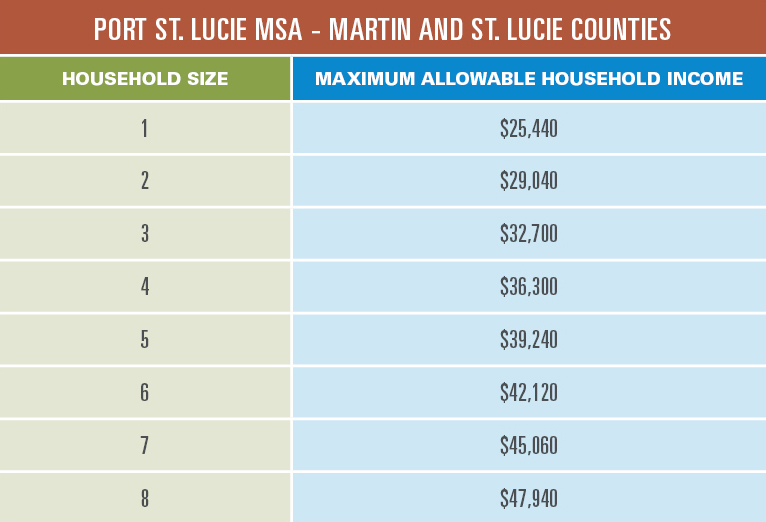 MAXIMUM ALLOWABLE HOUSEHOLD INCOME: HUD (“US Department of Housing of Urban Development”) publishes annual income limits based on household size that are used to determine the maximum household income. Be married and eligible to file a joint tax return. Be a single parent with dependent children. Receive benefits from AFDC or TANF (does not include SNAP or disability benefits from Social Security). Be enrolled in a job training program under the Job Training Partnership Act (JTPA) or a similar program. Be a person who was previously under the care and placement of the State agency responsible for Foster Care. Full-time student status is determined by the educational institution attended. Enrollment in even one college course may be considered full-time. All children in kindergarten, elementary, middle or high school are considered to be full-time students.